Earlier this week we had our hopes up with a weather forecast that called for snow measured in feet! Emotions were elevated and then the storm headed south and so did our snow! This afternoon’s report is for snow Friday and Friday night, freshening things up for the weekend. The week ahead shows lots of sunshine and if it’s not snowing, we’ll gladly take the blue sky! With the nice weather comes sunglasses, hiking up Baldy and skiing the chutes, lunch outside on the mountain and lighter clothing. In February, it’s a temporary warming spell and we know winter conditions will retun. We won’t call it spring skiing because it’s too early. That’s the thing with mountain life, you’re prepared for whatever weather comes your way, as most skiers know. 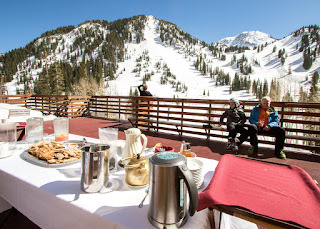 Afternoon tea on the Alta Lodge deck on a warm, sunny day.